District Development Commissioner Ganderbal, Dr Piyush Singla was the chief guest. 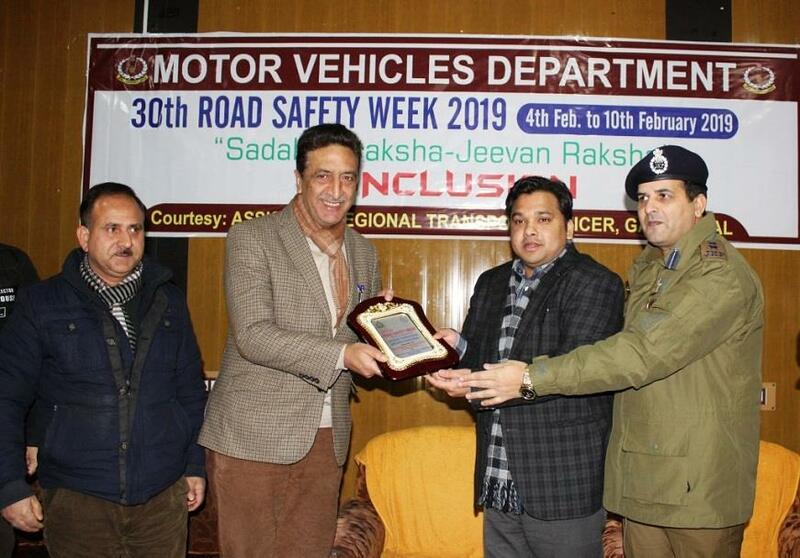 Appreciating the department for regularizing the traffic in the district by way of taking effective initiatives, he said that district administration is committed to provide better road connectivity by way of widening important roads of the district. He also asked the District Motor Vehicle Department to organize similar traffic awareness camps in other parts of district to make people aware about traffic rules and road safety measures. SSP, Khalil Poswal while speaking on the occasion, highlighted the importance of safety rules needed to be followed while driving on the road. He advised the gathering to be a responsible citizen by following traffic rules as everything cannot be enforced with tough action and punishment. Later DDC along with SSP felicitated media persons and transporters for actively participating in the week long campaign.